The aims of the NCC laid out in 1988 have stood the test of time and continue to meet the requirements expected of it in the current socio–economic scenario of the country. The NCC aims at developing character, comradeship, discipline, a secular outlook, the spirit of adventure and ideals of selfless service amongst young citizens. It aims at creating a pool of organized, trained and motivated youth with leadership qualities in all walks of life, who will serve the Nation regardless of which career they choose. 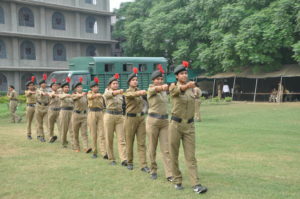 Needless to say, the NCC also provides an environment conducive to motivating young Indians to join the armed forces. To Develop Character, Comradeship, Discipline, Leadership, Secular Outlook, Spirit of Adventure, and Ideals of Selfless Service among the Youth of the Country. 5. To Provide a Suitable Environment to Motivate the Youth to Take Up a Career in the Armed Forces. To build confidence in them. To develop competition spirit among them. By telling them about the importance of disciplines in their life. By taking their mentoring, EVS, Go-green and value education classes.